Up to three hundred times as sweet as sugar, the calorie-free steviol glycosides in stevia have been known and exploited for at least 1500 years. The Guaraní of South America (centred around modern-day Paraguay) are the first known human users of stevia, using it to sweeten teas, as a medicine, and as a treat. Their name for it is ka’a he’ê, meaning “sweet herb”. The species was scientifically described in 1899, while the glycoside compounds were isolated and identified in 1931. In the 1970s, stevia became commercially used as a sweetener in Japan, but its adoption in North America and Europe has taken somewhat longer (see, e.g., this March 2014 discussion from the Harvard Medical School: “More about stevia, a non-approved sweetener“). Regulations continue to loosen as studies are completed, and stevia (or at least its derivative (and presumably patented / trademarked) compounds) is now found in many reduced-calorie / no-calorie foods and beverages. Estimates for the global market value in 2014 of stevia were in the range of 336 million USD, with forecast for a 550+ million USD value in 2024. This could have been a significant part of Paraguay’s economy (GDP of 27.5 billion USD) had production remained within the country, but the largest global producer of stevia is China. Efforts are being made to develop it as a crop in the USA. 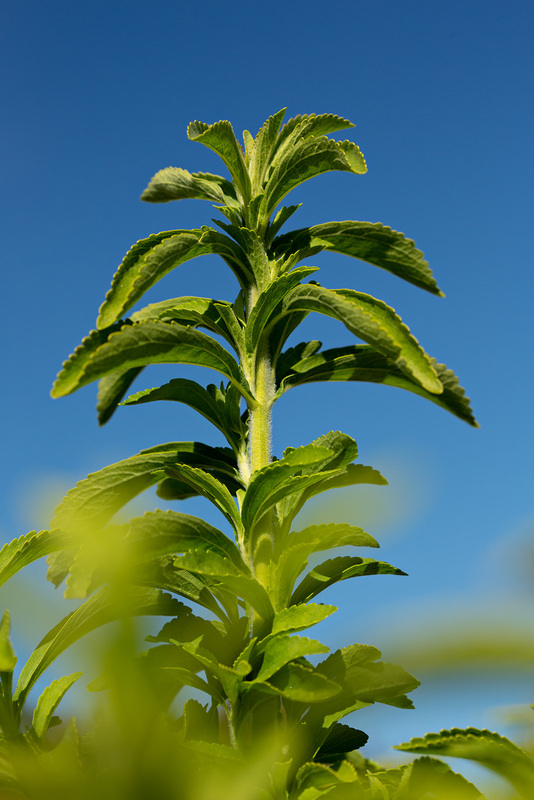 Stevia is a member of the sunflower family. I didn’t get a chance to see this small shrub in flower (likely too short of a growing season here), but an image of the inflorescence is here: Stevia rebaudiana inflorescence, via Wikimedia Commons. I will admit to sampling a leaf from today’s plant, which I enjoyed more than the taste of products sweetened by its extracts. Interesting to learn a bit of the history. I often dry the leaves from the small plant in my garden in Northern California, and add it to my tea leaves for a bit of sweetening. Adds a subtle sweetness that I enjoy. Daniel, I always like to reply you entries but I have to look again to see if there is an answer, is there any way for us to be notified if someone replied? I’ll look into it, I know there are some plugins that allow comment notifications. Might not be until November, a lot on the go over the next 6 weeks. Does anyone know if this particular Stevia will grow in northern Australia please . Does it require a lot of sun ? A stevia plant was sold to me about five years ago as an annual—luckily it didn’t get the message, and it still thrives and even creates new plants. I’m in Memphis, Tennessee (USA,) where our last frost, officially in April, is often in March, and our first frost may not occur until December. Winter lows rarely fall below the Fahrenheit teens, and summer heat can go on a long time. I have it pretty much in full sun. I hope this helps Rita and anyone else that wants to grow it. Beautiful photo! The flowers show it is quite far from the sunflowers in the sunflower, chicory, thistle, daisy, ragwort, mugwort, dahlia, marigold, yarrow, curry plant, Gerbera, Curio, etc. family. Stevia is in the tribe probably best known for Hemp Agrimony in Europe and Joe Pye Weed or boneset in America, the Eupatorieae.